West Ham have been fined £71,000 by Fifa for breaching rules over striker Diafra Sakho but no action has been taken over their place in the FA Cup. Striker Sakho withdrew from Senegal's Africa Cup of Nations squad with a back injury but scored 18 days later in West Ham's Cup 1-0 win at Bristol City. Bristol City say they are disappointed by the penalty and are "considering their options". Fifa has reprimanded both West Ham and the 25-year-old forward. Football's governing body says a player cannot appear for his team when he should be on international duty. But the Hammers, who got £90,000 from the FA prize fund for winning their fourth-round tie, have escaped potential expulsion from the FA Cup and will travel to West Brom in round five on Saturday 14 February. West Ham will also be able to select Sakho, their top scorer this season, for Sunday's Premier League home match against Manchester United. Manager Sam Allardyce said he had left the forward out of last Saturday's 2-0 defeat at Liverpool after being advised to rest him until the dispute was resolved. Fifa fined West Ham 100,000 Swiss francs (£71,000) after a disciplinary committee found the club and the player to have violated its regulations by playing in the game at Ashton Gate. Sakho came on as a substitute and headed in the 81st-minute winner two days before Senegal were knocked out of the Cup of Nations. 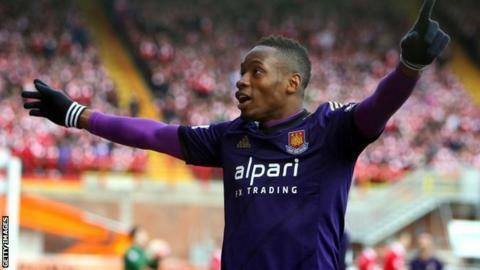 The Hammers said he had not been fit enough to fly to Africa and was driven in a limousine to Bristol City. A club statement after the Fifa decision said: "The club and the player have received the decision and will now be focusing their concentration on the game against Manchester United on Sunday." Bristol City said in its own statement: "The club is disappointed with the penalty handed down by the Fifa disciplinary committee and is considering its options." The club has not commented on newspaper reports it could seek compensation of up to £250,000 - a combination of lost prize money and gate receipts. Under its rules, Fifa could have requested the Football Association reverse the result of the Cup tie.